What a beautifully heartfelt story! Whilst reading Because of You we felt as though we had been transported back in time to the YA stories (please note this is not a YA book – the characters are in their early 20’s)) that are forever ingrained in our hearts. The innocence, the emotion and purity of the storytelling, where it is all about the story, was evident throughout Because of You. Laura Ward really does delve deep into her characters bringing their struggles to the forefront in an honest and sincere way. 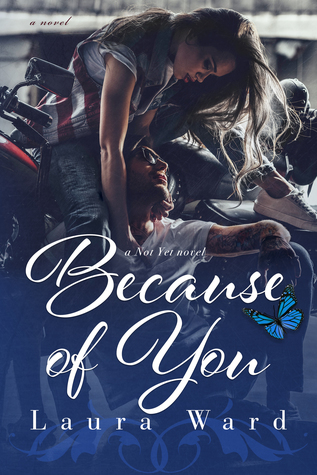 And whilst Because of You is part of the Not Yet series it can very easily be read as a complete standalone. At its heart, Ricky and Aveline’s story is about sacrifice, family, love and forgiveness; at its core, it is a story reflecting a young man’s struggle to care for his family following a tragedy born of heroism. O f a young man’s unwavering love and devotion to his parents and his sister’s welfare. It also tells the story of a young woman wanting to break free from her gilded cage and how Aveline Gerard’s life is changed irrevocably when she meets Ricky Martinez in their Psychology 201 class. As fate would have it, Ricky soon learns Aveline is the little girl, who father selfishly saved, some eighteen years earlier, and was the cause of Pedro Martinez’ quality of life being so drastically changed. Ricky harbors much pain and anguish and a lot of bitter resentment for Aveline’s parents, who he feels responsible for his father being a quadriplegic due to their inattention for their child. Ricky and his family are poor. Ricky unselfishly gave up a Football scholarship to work and provide financial assistance to his family, working two jobs to help his Mum. Every day is a struggle to go to school and work the hours needed to put food on the table. Ricky is exhausted and hurting. Aveline on the other hand is twenty two, lives with her wealthy parents, has never attended school, never had a boyfriend, and pretty much never been outside the walls of her opulent home. There is such a sweet innocence to Aveline due to her sheltered life and overprotective parents. They nearly lost their daughter once, they are fiercely protective to ensure nothing ever happens to Aveline. Ricky wants compensation from the Gerard’s for what his family have endured for the past eighteen years, to pay for the hardships they’ve faced. After all, whilst his family have been suffering, Aveline’s parents seemed to have been living a life of happiness, wealth and privilege. When paired for a psychology assignment on ‘nature vs nurture’ Ricky and Aveline must learn all about each other’s lives. They must visit each other’s homes, and become well versed in everything about one another, and this makes for an interesting time. Ricky’s bitterness towards Aveline softens when he gets to know her and develops feelings, but will the truth tear them apart. We had lots of questions about what had transpired the day of the accident and the years that followed, and Laura Ward answered all of them, leaving no stone unturned, and hitting our hearts along the way. Our hearts ached for Ricky and his predicament, this poor bloke needed a break. From her impassioned prose to her stirring emotion, Laura Ward gave us a story that was thought provoking, sweet, honest and heart rending. An authentic, inspirational and moving story of first love, self-discovery and an unending desire to love and be loved. Beautiful, quite simply, beautiful. All Ricky Martinez knows of life is loss, loyalty, and family. When his father became a quadriplegic after breaking his neck saving a drowning girl, Ricky gave up his dreams of playing football at a big college to stay home and take care of his family. His new dream? Find the girl who caused his father’s injury and get justice. Because of her, his family lost everything. All Aveline Gerard knows of life is a quiet, protective love. Homeschooled ever since her accident eighteen years ago, Aveline’s parents, both deaf, have kept her safe the only way they know how—sheltered, and alone. Aveline’s deepest desire? To experience life in all its loud and messy glory, and the tattooed guy in her first college class is all of those things. Because of him, her life is finally beginning. But fate has a wicked sense of justice and when Ricky realizes the sweet, shy girl in his class is the one who wrecked his family, will he be able to walk away? Or will the bitter rage inside cause him to make the biggest mistake of his life? Because of them, the pain of two families will finally collide.